Moderate growing to 10 to 15 ft. tall, 4 to 6 ft. wide. Larger with age. 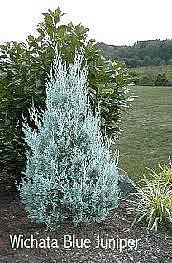 Give this robust silver-blue Juniper lots of space. It is a rugged and reliable plant for large-scale screening, massive hedges and windbreaks. Also works well as a single specimen in lawns or in conjunction with other ground covers. Use as a corner element street side or to interrupt long fence lines.